Garmin nuvi 3598LMT car sat nav has a 5-inch touchscreen which can be used in dual orientation and comes preloaded with street-level road maps of Europe which are free to update. The nuvi 3598 features the new free lifetime digital traffic information which is twice as fast as other sat navs. It is also Bluetooth enabled allowing hands-free calls and also supports voice activated navigation. Plus it is smartphone link compatible so you can get information such as weather and PhotoLive Traffic Cameras. The Garmin nuvi 3598LMT also features a split screen which shows the navigation map and Active Lane Guidance or PhotoReal Junction which provides essential information at each junction and exit. It also features 3D terrain and 3D buildings and landmarks. Speed camera locations are also included for free. Garmin nuvi 3598LMT-D has been discontinued. Accessories, spares and parts are still available for your nuvi 3598, as are the road maps. Garmin nuvi 3598LMT-D is a top-of-the-range Garmin nuvi Premium series car sat nav that features a 5-inch touchscreen display. The Garmin nuvi 3598LMT-D features Digital Traffic Information which works twice as fast as other sat navs. This Garmin also features a free speed camera database preloaded to the device. The units display also offers dual orientation, so you can use it in landscape or portrait mode and it features pinch and zoom technology. The Garmin nuvi 3598LMT-D also supports voice activation which allows you to operate the device via spoken commands such as "go to home" or use the Bluetooth capabilities and use a command like "call Mr Smith". The nuvi 3598LMT-D is part of Garmin's premium sat nav range. If you are looking for a larger 7-inch screen then we recommend buying the nuvi 2799LMT-D.
Preloaded with street-level European maps including UK, Western and Eastern Europe the nuvi 3598 is ready to use straight from the box in more than 40 countries. What's more the pre-installed maps are FREE to update for the lifetime of the product - with typically 4 updates available FREE each year. 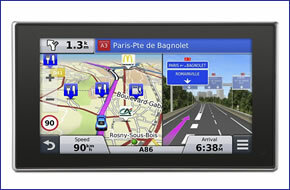 This sat nav also includes 3D terrain view and 3D landmarks so that you can navigate using these premium 3D features. The nuvi 3598LMT-D also features FREE Lifetime traffic updates covering all motorways and A roads. The traffic information is displayed on the units split 5-inch screen with the left half of the screen showing the route you are driving while the right half displays traffic reports which are also spoken to you via the sat navs built-in speaker. The 3598LMT sat nav will also inform you of how many minutes the delay will take and also calculates possible detours. Garmin nuvi 3598 premium sat nav is Bluetooth enabled making it possible to make and receive hands-free calls via the integrated microphone and speaker. The Garmin nuvi 3598 also features smartphone link which enables you to get information such as weather, PhotoLive Traffic Cameras and more direct from your nuvi using the Bluetooth connection when paired with a compatible smartphone. Garmin now offers Garmin Real Directions which uses recognisable landmarks, buildings and traffic lights to guide you to your destination. For example the device may speak “turn right after the cathedral.” The 3598 also displays the estimated time of arrival. The Garmin 3598 has a point of interest database including businesses, stores and restaurants. There is also an Up Ahead feature which will warn you of nearby services, restaurants, petrol stations and stores. The nuvi 3598 also supports voice activated navigation so you can navigate and find points of interest whilst keeping both hands on the steering wheel. Speed camera locations are included with the Garmin 3598 and you can (via subscription) update this database using the unique Cyclops speed camera database. On approach to a speed cameras location overspeed warnings and speed limit information is also displayed. Included in the Cyclops database are locations for fixed, mobile, variable limit, average speed cameras, temporary, mobile zones and red light speed cameras. New or moved cameras are constantly tracked and Cyclops checks and updates its central database daily. The Garmin 3598 navigator also contains a speed limit database and displays your vehicles’ speed for most roads in Europe. Do you have a question about the Garmin nuvi 3598LMT-D that's not been answered on this webpage? Please see our car sat nav FAQs for questions from other customers and visitors. Plus if the answer to your question isn't featured, use the online form to ask us for the answer. Alternatively please telephone 01733 777623 Monday to Friday (9:30am-5:00pm) to speak to one of our sales team. Garmin 3598LMT-D is a plug-and-play sat nav, it can be set up and removed in seconds. The nuvi 3598LMT-D is powered by an in-car charger that plugs and powers via your vehicles cigarette lighter adaptor. A suction cup mount and cradle attaches to your vehicles windscreen to provide a secure base to view the units screen and navigational instructions. Both the car charger and windscreen mount are in the box when you buy the nuvi 3598LMT from ActiveGPS. Garmin nuvi 3598LMT-D is preloaded with street-level here maps (formely NAVTEQ) for both Western and Eastern Europe. To view the map coverage for a specific country or region please click the following links for more details: UK and Ireland, France and Benelux, Spain and Portugal, Germany, Austria and Switzerland, Nordics, Italy and Greece, and Eastern Europe. If you'd like to buy additonal maps for another region (outside of the nuvi 3598 preloaded European map region). e.g. North America or Australia and New Zealand. These can be viewed and purchased via the nuvi 3598LMT-D map page. Looking for accessories and spares for the Garmin nuvi 3598LMT-D? View them all here. All parts are genuine Garmin product and specifically designed for use with the 5-inch nuvi 3598 sat nav. Accessories available to purchase include a 5-inch slip case, mains power charger and a weighted dashboard mount. Along with these accessories, it's also possible to buy replacement parts such as suction cup mount and vehicle charger. View all the nuvi 3598LMT-D accessories here. Looking for sat nav maps for the Garmin nuvi 3598LMT-D? View them all here. All mapping comes on microSD card with SD card adaptor and is genuine Garmin product and specifically designed for use with the nuvi 3598. Areas available to buy include: Southern Africa and Middle East and Northern Africa. Answer: The latest City Navigator NT North America map for your Garmin nuvi 3598LMT-D is priced at £64.99 + postage (see website for delivery options). You can buy it online here. Yes, American vehicles like the UK have a 12-24volt cigarette lighter socket. So you will be able to take and use your existing Garmin nuvi 3598LMT-D vehicle power cable. Should you require any other accessories for your Garmin nuvi 3598LMT-D you can view them all online here. Additional mapping options can be viewed and purchased online here. Question: Garmin nuvi 3598LMT-D Automotive GPS Receiver. If I do not have a dab radio in my car, will the traffic update feature not work? Answer: The Garmin nuvi 3598LMT-D Automotive GPS Receiver works independently from your vehicles audio system. So as long as you have the correct Garmin nuvi 3598LMT-D vehicle power cable/traffic receiver either GTM36 (using FM signal) or GTM 70 (using DAB signal) you will receive traffic information. You can purchase either cable here via the Garmin nuvi 3598LMT-D accessory page. Question: I want to update my nuvi 3598 but got a message telling me there was not enough space? Not very good with technology, but wonder if you could explain how I get round this one? I may have updated it once before since I bought it, or maybe I haven't. Answer: We have no involvement with Garmin downloads. Mapping updates that we sell come supplied on preloaded SD/microSD Card. These SD/microSD Cards are simply inserted into your nuvi 3598 sat nav and the data is then read from the SD/microSD Card. This method does not affect the memory of your nuvi sat nav. Click the following link to view all available maps on SD/microSD Card from ActiveGPS, all maps are genuine Garmin map software. Question: Is it possible to setup my Garmin 3598 LMT-D to suit caravan routes? Answer: The Garmin nuvi range (which the nuvi 3598 is part of) cannot be upgraded to feature caravan profiles and routes. This feature is only found on the dedicated Garmin Camper range. Do you have a question about the Garmin nuvi 3598? Submit your question via our contact page.